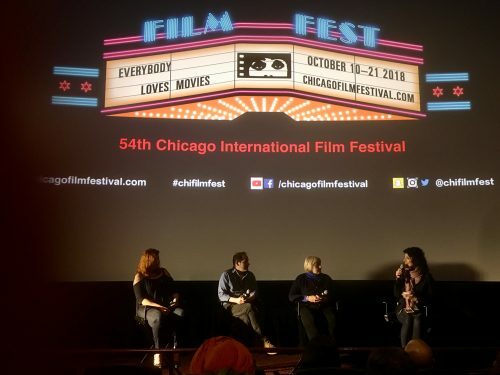 Attending the 54th Chicago International Film Festival this year was an incredible experience. CIFF is an annual festival held every fall and the longest-running competitive film festival in North America. I was lucky to attend a few screenings as well as the Industry Days Program, which included a four day series of events for film industry attendees. The shorts I attended were part of a program series called Laughing Matters. Beyond the genre of comedy, the films were deft comedic responses to the various failures of capitalism, the absurdity of nationalism, and effects of globalization around the world. It was refreshing and cathartic to see this heavy and complex topic treated with humor. Merry-Go-Round (dir. Ruslan Bratov, Russia) follows a group of drunk businessmen that end up at a local amusement park late at night and get stuck on a merry go round ride. Most of the film takes place with the men spinning around and ’round on this ride, beginning with glee and exhilaration that slowly morphs into motion sickness. One man eventually throws himself off of the ride while the other men slowly pass out as the ride keeps spinning. The entire experience felt like a metaphor for the way businessmen treat the world, the debauchery and seeing the world as an amusement park, and as the ride keeps going, the world keeps spinning outside of their control. An Exemplary Citizen (dir. Kim Cheol-hwi, South Korea) stood strong as an allegory in which a young man enters a racetrack bathroom and, disgusted by its appearance, decides to clean it. The walls are covered in stickers, many of them advertisements for loans, and the toilet is clogged with feces. If one can get past the revolting image of the man unclogging the toilet with his bare hands (which it seemed much of the audience had a hard time getting through and gave up on the film because of it), then the film stands as a testament to the kind of efforts that are needed by humans who, as participants in a society, must clean up the mess that has resulted from a wasteful system. In Welcome Home (dir. Armita Keyani, Norway) an Iranian refugee couple in Norway welcome a pair of Jehovah’s Witnesses into their home. The film brilliantly deconstructs stereotypes while achieving multiple laugh-out-loud scenes. To Plant a Flag (dir. Bobbie Peers, Norway/Iceland) follows two astronauts training in Iceland and their encounter with a farmer, and Mamartuile (dir. Alejandro Saevich, Mexico) follows a Mexican president as he deals with an unexpected international conflict. These two satirical films touched on the absurdities of nationalism and patriotism. All in all, I was impressed by the programmers’ selection of films and their ability to achieve a cohesive theme beyond the generic genre of comedy. In addition, many of the films had already screened at other well-known film festivals in the country, including Tribeca and Palm Springs. Some highlights from Steve McQueen’s masterclass event from Industry Days include much of what he had to say about his artistic process as a filmmaker and director (whose feature films include Hunger, Shame, 12 Years of Slave, and newly-released Widows). Take-aways included the importance of creating a safe space and environment for actors, letting the camera roll, and using the location as a character. In addition, it’s clear that his immersion into the art world as a painter and video artist prior to making narrative films has had a tremendous impact on his work. His approach of breaking down the story, frame by frame, takes his work to another level. He lives for moments of ingenuity. The finance and distribution panels at the festival were extremely informative and engaging. I appreciated the break-down of distribution deals that some of the panelists covered, including the importance of minimum guarantees and how marketing costs factor into your distribution deals, as well as profit sharing. One of the biggest highlights at the festival was the screening of This Changes Everything directed by Tom Donahue. The documentary dives deep into the long history of gender disparity in Hollywood and the film industry. The film examines the EEOA lawsuit that was filed by six female directors, “The Original Six,” against Hollywood studios in the 1980s for discrimination, only to find their case dismissed. The film also sheds light on the Geena Davis Institute, an organization that has provided groundbreaking data on women and girls in the media. The film itself acts as evidentiary support to the often dismissed notion of gender inequality in Hollywood, both in front of the camera and behind the scenes. I really hope this documentary gets the distribution deal that it deserves.